de Mamiel's Intense Nurture Antioxidant Elixir is formulated to fend off sensations of environmental and emotional stress, and give a replenished look to skin. Optimal levels of natural antioxidants and phytonutrients tone down signs of inflammation, and restore the appearance of suppleness and improved elasticity to skin. A unique blend of Malachite, Superoxide Dismutase and essential oils reduce the look of cellular damage and maintain skin's taut, supple appearance. Use twice daily, after cleansing. Dispense 2-3 drops into palms and smooth over face, neck and decollete. Follow with Exhale Daily Hydrating Nectar. I am really grateful I got to try this in the Beauty Heroes box. It has a wonderful, relaxing scent and leaves my skin feeling hydrated. It is a nice ritual to do before bedtime. I have not seen any noticeable results except the dewy effect, so I will not be spending the $135 to repurchase when it runs out, but I will use it up and will try other deMamiel products in the future. I am very grateful that this was featured in one of the monthly boxes, because I never would have tried this on my own due to the price. Because of said price, I really didn't want to fall in love with this. Now...I don't know if I can be without it, and that's dangerous to my bank account. (Sigh.) My first impression of this product was that it is similar to the Kypris Antioxidant Dew. They are both milky serums with a water/glycerin base. 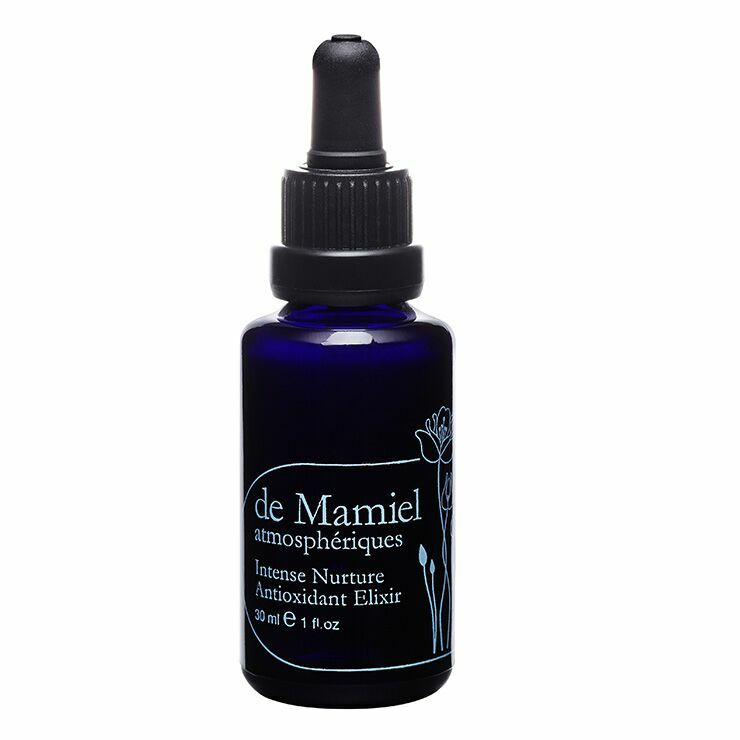 However, the de Mamiel elixir is a tad thicker and has an even longer list of impressive ingredients. Because of the citrus oils in this, I have only been using it at night, and I like to mix it with a few drops of another facial oil. It's especially great mixed with any of the Zelens Power Drops or the Odacite oils. Since adding this to my routine, I have definitely seen a difference in the tone and texture of my skin. After four pregnancies, I have been trying for some years to brighten dark spots on my face and even out my skin tone. This is one of the few products I've used that gave me any noticeable results. The price makes me want to cry, but when I think of all the money I wasted on products that didn't work half as well...that's even more depressing. So it looks like I will be repurchasing in the future, or requesting it as a gift for birthdays and holidays. Great for skin barrier repair! I used this mainly as an essence before my serum morning and night. I have very sensitive skin and this didn't irritate or break me out at all. It has a very subtle natural scent that wears off almost immediately, which I appreciated. The consistency is milky, and spreads nicely on the face. I've only been using it for a month, so I can't attest to its anti-aging ability but I will say that my face seemed calmer, less irritated, and the elixir without a doubt, improved my skin barrier. For anyone who has a compromised barrier, this is definitely for you! I struggled with exfoliation, even once a week, because my skin had a hard time repairing itself afterwards. After using this elixir, I'm happy to report that I can exfoliate 2x a week without any adverse effects! Lightweight on the skin and my face felt sealed and tightened. This does wear off in a short time and you barely notice it on. The smell doesn't linger like the sidekick product this month which is nice. However, it isn't very moisturizing which surprised me. I am thankful to have been able to try this because of the price point I would never have purchased it outright. Thank you Beauty Heroes! Got it in the April box and used it twice everyday since. The milky white serum is very soothing and hydrating. It does not leave your skin greasy but soft and velvety. And it layers very well. I really like it thus far !